The term “Whit Monday” is related to the word “Whitsun” that is used in the English language for the festival of Pentecost. Pentecost was one of the three baptismal seasons, and the name “Whitsun” (contraction of “White Sunday”) is believed to refer to white garments that those newly baptized used to wear on this feast. Whit Monday is the day after Whit Sunday and the first day of the so-called Whitsun-week. 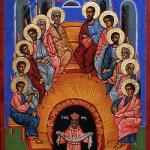 In many countries, Whit Monday is also referred to as the second day of Pentecost. In Liechtenstein it is even more popular than Christmas. It Germany, it is considered the holy day of obligation for Roman Catholics, i.e. the day when they are obliged to attend the Mass. About 30% of the total population of Germany declare themselves as Roman Catholics. Whit Monday does not have any specific traditions. Lately some countries where it used to be a public holiday has started to replace by other bank holidays.